Following our residency in Beijing at the Tsinghua University that ended last July, fabric | ch transformed itself into the organizers of a call (!) that will run between next september and october, in partneship with TASML (Beijing). The call is closely related to the work and workshop we've done in Beijing. The results of this CALL (1st price) will be presented during the next Lisbon Architecture Triennale, CLOSE, CLOSER (curator Beatrice Galilee), so as another list of EVENTS, as an Associated Program and during a talk together with fabric | ch. An Award of Distinction is open to international submissions. You can find below a copy of this open call dedicated to individuals or interdisciplinary groups of students and faculty members of Tsinghua University in the fields of Architecture, Design, Art and Sciences (1st prize), so as to the international community (students and professionals, Award of Distinction). In collaboration with fabric | ch, Tsinghua Art & Sciences Research Center Media Laboratory (TASML) is pleased to announce an open call to the Tsinghua community for individuals or interdisciplinary groups of students and faculty in the fields of Architecture, Design, Art and Sciences. Conceived by fabric | ch, the competition is inspired by Deterritorialized Living, a workshop, a project and series of online “tools / atmospherics” developed on the Tsinghua campus during a recent residency. Inhabiting the Computer Cabinet competition (Deterritorialized Living, the Beijing sessions) will be an Associated Project during Close, Closer, the much anticipated Lisbon Architecture Triennale that will take place in late summer and fall of 2013, curated by Beatrice Galilee, Liam Young, Mariana Pestana and Jose Esparza Chong Cuy. 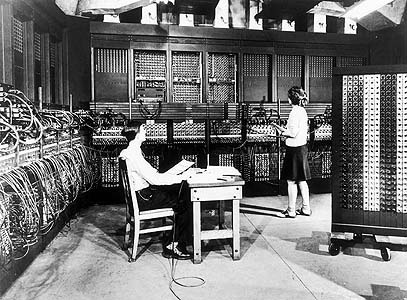 One of the first general purpose computer, the Eniac I, back in 1946. Context: Since the public emergence of the Internet and the web in the mid ’90s and the ubiquitous presence of wireless communication, peer to peer exchanges, and social networks of all kinds in recent years, we have witnessed a growing tendency towards horizontally mediated decentralization. These conditions have not only deeply influenced the ways in which people and societies interact (social interactions, exchanges, mobilities, artifacts, economies, etc. ), but have also affected how clusters of computers and hardware collaborate or exchange information. To some extent, networks have generated some sort of “geo-engineered” milieu that triggers an experience of delocalization: ambient deterritorialization that is always around, always on. 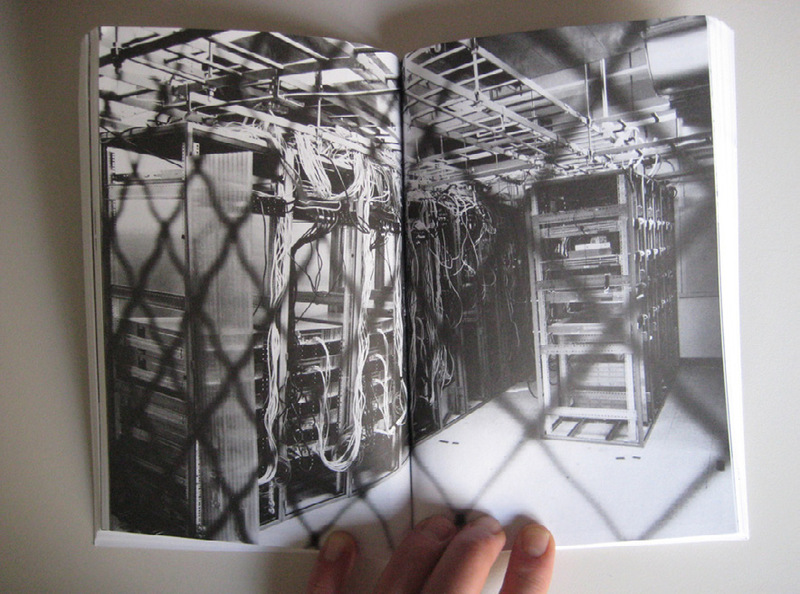 … and a picture of several servers cabinets taken out of Clog: Data Space (2012). 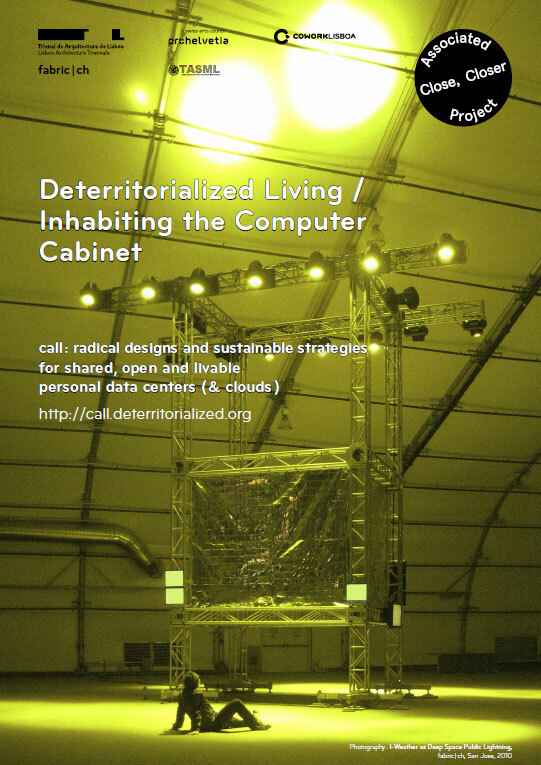 Based on the context above, we are calling for proposals under the title of Deterritorialized Living (Beijing sessions) / Inhabiting the Computer Cabinet. Objective: An abstract space of 9 square meters is proposed for the competition, to be designed into a large computer cabinet that is inhabitable. Its exact shape, height and volume are to be defined by the candidates. The computer cabinet functions as a small data center. A certain number of servers, NAS (networked attached storage), virtual machines, etc. are therefore also installed within this space. The inhabitant(s) have to share the space with the machines in some ways. The status and/or security of the data could also be addressed in some creative ways. Goal: by taking advantage of the physical, informational, computational, chemical, biological, environmental or climatological features of the facility (inside and outside), the project focuses on creating a livable environment within the computer data cabinet (or personal data center). The outcome of the project could be to engage with the overall design or to develop a very specific device, object, software, interface and/or installation within this given framework. http://www.deterritorialized.org is an artificial atmosphere conceived by fabric | ch that is delivered in the form of algorithmically constructed data feeds. It is composed by a set of web services and libraries that were developed in the context of a residency on the Tsinghua University campus in Beijing, between Spring and Summer of 2013 (at TASML). The open data feeds of this "geo-engineered" climate can be addressed and used by any custom designed program or device (the website will be open from the 6th of September). These open-source, “ambient deterritorialization” data feeds and environments in the form of Deterritorialized Air (N2, O2, CO2, Ar), Deterritorialized Daylight (Lm, IR, UV) and Deterritorialized Time can be freely used in the context of this competition. Email submission, in one email with one pdf file attached, to call@deterritorialized.org, maximum size limit is 20mb, with the title of the message as the title of your project. Name / surname, Tsinghua school or department affiliation (or profile for Award of Distinction), email address and date of birth of the representing member for the team (one person only). Names / surnames, Tsinghua school or department affiliation (or profile for Award of Distinction), email addresses and dates of birth of all other members of the team. Short descriptive biography (not exceeding 150 English words of each individual). Links to additional visual materials, including video, website, etc., if needed. Images and diagrams summary of the project (most important elements, in screen quality). Project concept: describe the conceptual reasoning of the project. Project description: describe what it does practically. Technical description: describe the technical components of the project. Note:Proposal should be written in English. Project title should be listed in the lower right corner of each page on all documents. Quality of presentation and documentation (including technical, scientific description and visual presentation). The project shouldn’t be a “fantasy”. Its feasibility should be proven in some ways (demo, mockups, proofs of concept, technical schemes), even though the technologies proposed might still be in their research phase. Two prizes will be awarded by the jury, along with two honorary mentions. 1st prize: A trip for the winner or one representative of the winning team to Lisbon (including airfare and hotel) to present the results of their proposal during a talk, along with fabric | ch and TASML. Free viewing of the Triennial Close, Closer. This award is open to international submissions from students and professionals. fabric | ch is a Swiss based art and architecture studio that combines experimentation, exhibition and production. It formulates new architectural proposals and produces singular livable spaces that mingle territories, algorithms, “geo-engineered” atmospheres and technologies. Through their works, the architects and scientists of fabric | ch have investigated the field of contemporary spaces, from networked related environment to the interfacing of dimensions and locations such as their recent works about “spatial creolization”. TASML (Tsinghua University Art and Science Research Center Media) is conceived as a research and production unit that aims to synergize the rich resources available among the University’s diverse research institutions and laboratories to create an incubator for crossbred, interdisciplinary experiments among artists, designers, scientists and technologists. TASML also functions as a center and a hub for worldwide exchange and collaboration both with academic and research institutions and the global media art and design community. Through information sharing and knowledge transfer, TASML can also be seen as a catalyst of innovations for other disciplines in the arts and for the creative industry in general. COWORKLISBOA is a 750 m2 shared office for startups, nano companies and independent or mobile professionals such as designers, architects, illustrators, translators, among others. Getting fat and lazy @ home? Come, it is at LX Factory and Central Station in Lisbon. Close, Closer, the third Lisbon Architecture Trienale will put forward an alternative reading of contemporary spatial practice from the 12th of September to the 15th of December in Lisbon, Portugal. For three months chief curator Beatrice Galilee and curators Liam Young, Mariana Pestana and José Esparza Chong Cuy will examine the multiple possibilities of architectural output through critical and experimental exhibitions, events, performances and debates across the city.